Coming from a family as musically-inclined as hers, it’s only natural that eighteen-year-old Elisabeth, more affectionately called Liesl, dreams of becoming a composer. A female musician, however, is definitely not natural. Society would most certainly look down on her. In addition to that hindrance, Liesl already suffers from a severe lack of confidence in her music. She was never encouraged and educated with the same care as her brother, Josef, so instead she hides her dreams away in a locked box that lives under her bed. All her life, Liesl has always put herself last. As the oldest child in her family, it’s always been her job to look out for her younger siblings–her beautiful, golden-haired sister and foil, Käthe; and Josef, her brother with whom she shares an intense, almost unearthly, bond. This bond is actually where Liesl’s troubles begin. By favoring one sibling, she has neglected the other and put her in danger. When Käthe goes missing, Liesl immediately knows just who is responsible for her sister’s disappearance. The boy that she used to play with in the Goblin Grove near her house. The boy who was not actually a boy at all, but Der Erlkönig. The Goblin King of legend. The cruel Lord of Mischief. “I could not tell what color his eyes were from where I stood, but they were likewise pale, and icy. The Goblin King tilted his head in a duelist’s nod and gave me a small smile, the tips of his teeth sharp and pointed. I clenched my fists. I knew that smile. I recognized it, and understood it as a challenge. Okay, so this is a long one, but I have so many conflicting feelings about this one. 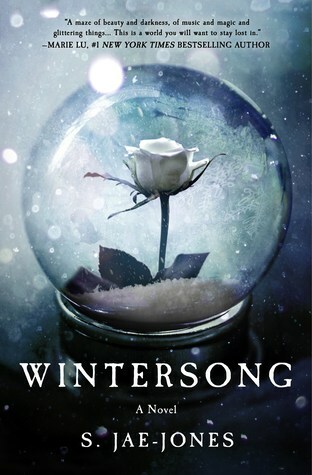 What actually first brought my attention to Wintersong is that I heard it was a retelling of Labyrinth (you know, the movie with David Bowie!). Labyrinth is a story I grew up with and retellings are kind of my thing, so of course I had to see what this book was all about. I never actually read the description, so I went into this one not knowing what to expect–was it going to be middle grade? Or maybe another fantasy romance? Was there even going to be romance? I had no idea. After reading, I can tell you it’s definitely not a direct retelling, but the two do share a main plot of the protagonist’s sibling being stolen followed by them having to outsmart the all-powerful Goblin King to win them back. If anything, this book bears a lot more similarities towards Cruel Beauty, a favorite of mine that I talked about in an earlier post. It is, therefore, more of a Hades/Persephone or Beauty and the Beast retelling than a Labyrinth retelling. After reading, I can also confirm that Wintersong is very much a more mature (not quite YA but not really NA either; it’s complicated) fantasy book with heavy romance, since there’s not much in the way of a plot. So I guess that’s where I’ll start. I’m a sucker for a good fantasy romance, and while I had definite issues with some parts of Wintersong‘s, this one was no exception. My issues mostly lie with the beginning of the romance. There were definitely some problematic parts that may be triggering for some–just putting that out there–and Liesl was a bit obnoxious with her back and forth feelings of instalove/desire/whatever-you-want-to-call-it mixed with her feelings of hatred towards the Goblin King. 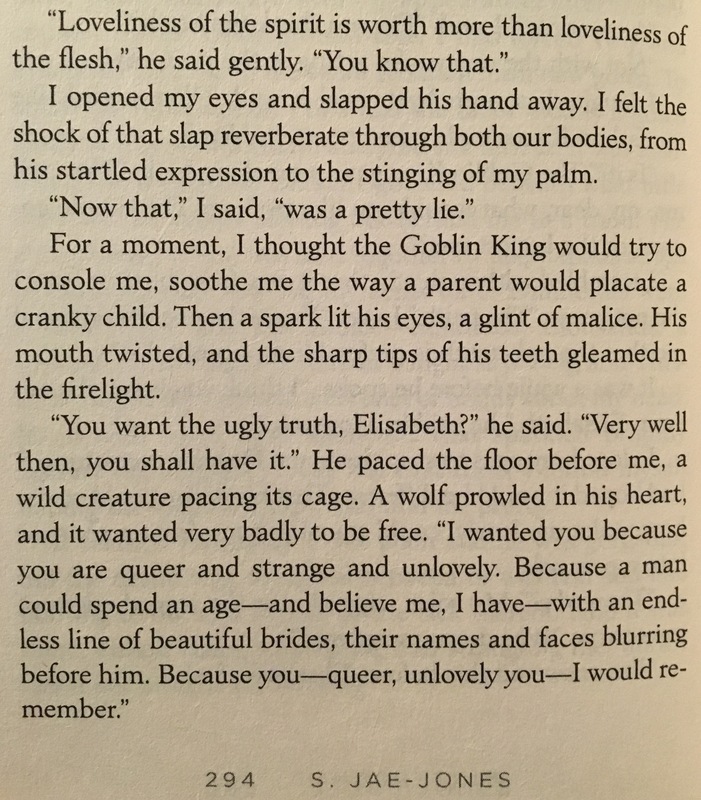 The Goblin King never holds back either, though. He tells it the way it is, and doesn’t dare tell any “pretty lies” to Liesl. It took a while, but by the end, the way that they could just be completely honest with each other was just #goals. Like the Goblin King, Liesl also has a cruel, dark streak in her, and I liked how they shared that and that we got to see this side of reserved Liesl come out. However, this is mostly a character-driven story, so if you can’t connect with Liesl, the book may not be for you. We are in her head for the entirety of the book, and I was thoroughly annoyed with her for the first sixty pages or so. Which is my second problem with the book. Right from the beginning, we are told that an audition is just about to take place. The problem is that the audition is just about to start… for sixty pages. I just kept waiting and waiting for it–for something to interesting happen–while Liesl whined on and on about how she would never be able to have anything that she truly desired in life. She was very “woe is me,” and none of her grievances made sense to me, like, at all. One minute, she’d admit what she wanted, and the next she’d profusely deny her feelings. I simply didn’t understand why she was acting like this–why she was the way that she was. BUT, as the book progressed and we learned more about her childhood, I began to see the bigger picture and finally understood how she became so miserable and why she thought so lowly of herself. After the audition, her objectives became more clear and, slowly, the whinier side of her began to fade. She had bigger issues to face. On the upside, the worldbuilding was well-done. More could have been done with the Underground, but I’m guessing there will be some expansion on it in the sequel, since it’s clear we aren’t getting the whole story of how the Underground came to be. The creepy goblins with their long, multi-jointed fingers, the pitiful changelings, and the eerie yet captivating Lorelei–I can’t wait to revisit all of the Goblin King’s strange mythical creatures and citizens and to hopefully learn more of their history. My third and final complaint has to do with repetition. There were so many overused words and phrases and even entire conversations that felt annoyingly repetitive. (Although, I guess one could argue that it makes the book read like a music piece with repetitive bars and sections.) Combine that with very little plot and you get passages that lag in a very noticeable way. In addition to Jae-Jones’ gorgeous writing, I listened to a playlist I made that I feel really enhanced my reading experience. It helped to bridge the gap during the moments that Liesl was writing and talking about her music–which is a large portion of the book– and also helped me connect more with Liesl. ⭐️ – I strongly disliked this book, and I don’t recommend it. ⭐️⭐️ – This book had a lot of issues, and I did not enjoy it. ⭐️⭐️⭐️ – This book was good! It had some problems, but I may still recommend it! ⭐️⭐️⭐️⭐️ – Ahh I loved this book!!! I strongly recommend it! ⭐️⭐️⭐️⭐️⭐️ – ABSOLUTE FAVORITE BOOKS. ALWAYS RECOMMEND. Life-changing, mind-blowing, or just books that touch my heart in a way that no other ever will. If you click the above image + make a purchase, I will earn a small commission which means money to be used for giveaways! Taylor has read 41 books toward their goal of 50 books.